KIEV, Ukraine -- Belgium will assist Ukraine in getting closer to the European Union, the Foreign Ministry of Ukraine has said. 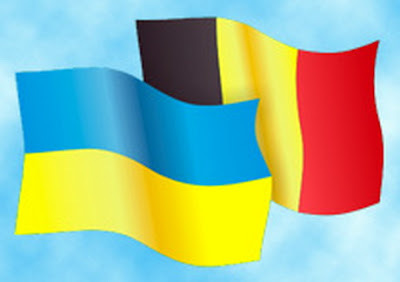 Ukraine (L) and Belgium flags. Ukrainian Foreign Minister Kostiantyn Hryschenko and Prince Philippe of Belgium, who is on an official visit to Ukraine, discussed Kiev's relations with the EU at a meeting on Tuesday, the Ukrainian Foreign Ministry reported. The sides devoted special attention to ways of deepening cooperation in the trade, economic and innovation spheres. The Ukrainian side acquainted the Belgian side with the steps that the Ukrainian government is taking to reform the economy and create better conditions for activities of foreign investors. During the meeting the issue of deepening the political dialog was also discussed, as was the realization of Ukraine's course towards the integration with the EU, including the results of the recent Ukraine-EU summit. "The Belgian side confirmed its readiness to render further practical assistance to the Ukrainian government in getting closer to the EU, in particular via the assistance in improving the security of identification documents and the introduction of biometric passports, as well as holding seminars for Ukrainian judges," the Foreign Ministry reported. The Belgian economic mission is on a visit to Ukraine on November 21-24.